A cup of coffee or tea in the afternoon is one of the best things in life. I appreciate not only the warmth, the flavor, and the caffeine, but also the break from computering while I prepare my cup and the afternoon light in our kitchen, which is on the opposite side of the house from my office. 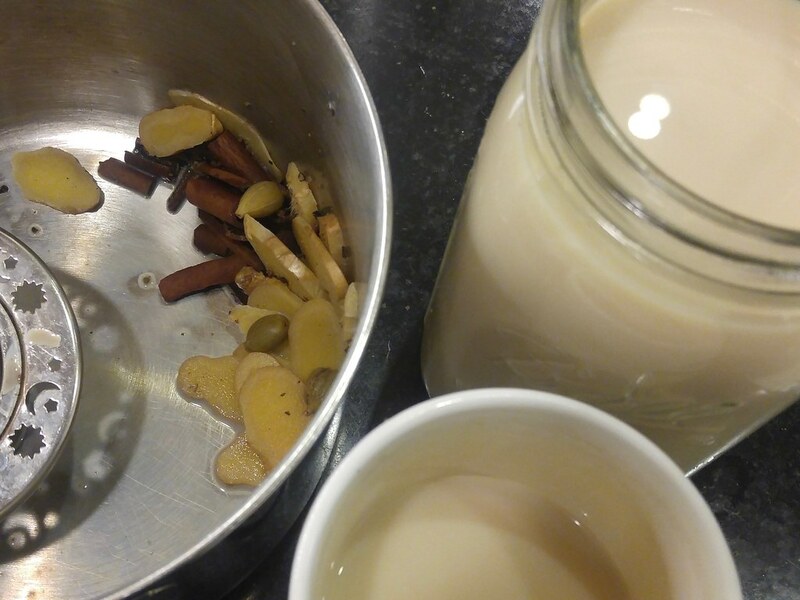 I enjoy drinking chai and have been having a lot of fun making it at home this winter. Ruth enjoys it, too, and my kids love the smell of the spices. Now that I've got the routine down, it doesn't take much longer to brew a pot from scratch than it does to steep a couple bags of Celestial Seasonings. I keep a constant supply of ginger root in the refrigerator now, as well as a stash of cinnamon sticks, green cardamom pods, cloves, and black peppercorns – all from the bulk spice corner of the Fort Collins Food Co-op – separate from our other kitchen spices. I don't bother to peel the ginger root anymore, and 2 ounces, thinly sliced, goes in a pot with 6 cups of water. While it comes to a boil, I pound 2 cinnamon sticks, about 8 cloves, 8 cardamom pods, and a tablespoon or more of peppercorns in a mortar. Not to a powder, but to pieces small enough to infuse quickly and large enough to strain easily. I simmer the spices for 10 minutes, turn off the heat and add loose tea in an infuser or tea bags if I've run out of loose tea. After 4-5 minutes, I remove the tea leaves or bags, and add 1/4 cup of sugar and 2 cups of milk. I usually have a mug as soon as I've warmed it back to a simmer and will let the milky chai remain in the pot with the spices to intensify the flavor. This recipe uses less milk and more tea than others I've found on the web. An early batch. I'm using more ginger and much more black pepper lately. Every time I add another peppercorn to the brew, I like it more. There must be a limit, but I haven't hit it yet.